Traditionally, Sancocho is a soup made up of seven different meats… yes, you heard that correctly, SEVEN meats! However, very rarely will someone make it with seven different meats. There’s also huge debates on what those seven different meats are. Sancocho, for me must have smoked pork chops! I love that subtle smokey undertone. It truly rounds out the dish. My grandmother NEVER made Sancocho or Asopao de Pollo without smoked pork chops, and neither do I. However, my Mother-In-Law (who by the way is a FANTASTIC cook), HATES smoked anything in her soups and stew. **Cue my fiance and I having our debates on what a true Sancocho is** As you can see, Sancocho varies in very close quarters. When making Sancocho, do not be intimidated. It’s really easy to tackle many different traditional Dominican dishes and abandon this one because it’s daunting. However, it’s only daunting because you understand the magnitude of this dish and what it means to you and your family. The minute you understand that you can freestyle this dish however you like, you’ll be in good hands! 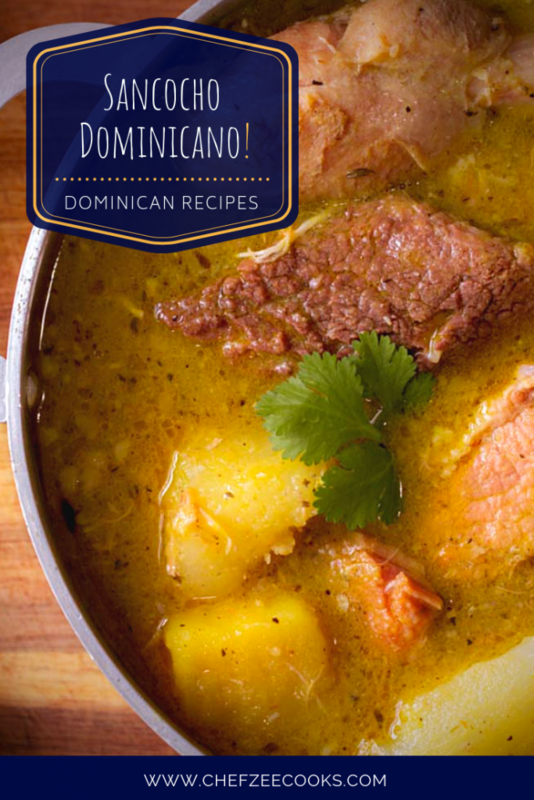 For example, my aunt is from the capital– Santo Domingo, and insists that Sancocho must have Longaniza and Oxtails. My other aunt who is from the Cibao region, strongly believes that Sancocho with corn is not Sancocho it’s, Sopa de Pollo. Recently, I’ve noticed that many Dominican cooks are adding plantain dumplings. And lastly, my God Mother doesn’t eat so bye-bye smoked pork chops in the Sancocho. 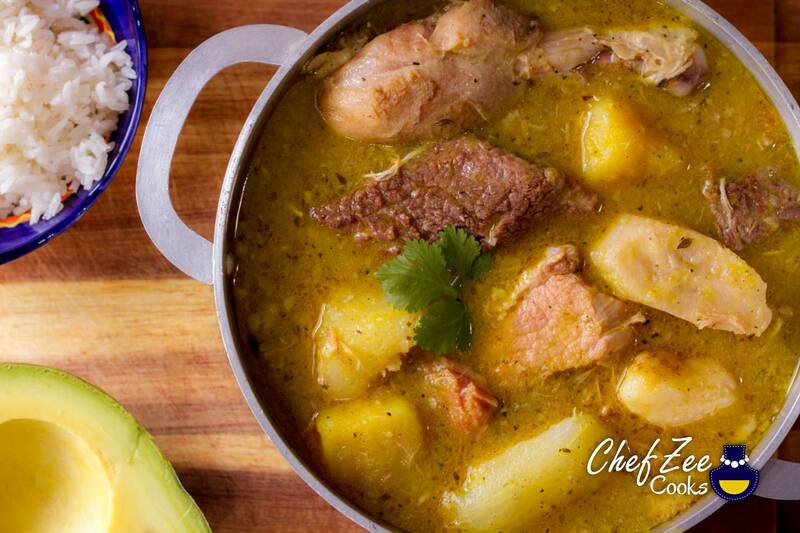 All in all, create a Sancocho that’s true to you, your family, and the flavors that you enjoy. Sancocho tells the story of a nation, culture, but more importantly– family. I created my Sancocho recipe to mimic the flavors that I love. I created a recipe that invokes the memory of my Grandmother. However, I added my own spin to it. Sancocho is also known for its viveres aka root vegetables. It’s no secret by now that I love yuca, auyama (kabocha squash), and plantains. My Sancocho is full of these hearty root veggies along with others that you may not have heard before. But don’t fear, add the root veggies that you like and frankly– add the root veggies that you can find in your local grocery store. I do recommend shopping at a Hispanic or Caribbean market when looking for the classic Sancocho viveres- root vegetables. If you’d like to see a step-by-step tutorial on How to Make Sancocho Dominicano | Dominican Sancocho visit my YouTube Channel: Chef Zee Cooks! And now for the recipe! …. Now add marinade to meat and massage into the meat until well combined. Now add 1 red onion, 1 white onion, orange pepper *optional, green pepper, 2 tbs Chicken Bouillon Cube, Recao (Cilantro/Culantro), and Fresh Thyme. Enjoy sancocho with white rice, avocado, fresh lime, and hot sauce!